Lufthansa has just announced a series of very attractively priced flights for tickets purchased by 15th of March, for departures comprised between 15.05.2018 – 28.02.2019. Among the offers, you can find Dubai for fares starting at 394 EUR. For a 7-hour flight, I’d say this isn’t bad at all. So if you haven’t been to Dubai and you are dreaming of it, it’s time for you to grab the tickets and start planning! Moreover, after the long winter and the low temperatures, nothing would be more welcome than some sunshine, right? Just imagine putting on a summer dress and a pair of flip-flops! How awesome would that be? And since I am heading myself to the UAE next month to visit friends and check what has been changed since I left Abu Dhabi, I thought this would make a good opportunity to prepare a quick travel guide for those of you interested to explore the great metropolis of Dubai. Dubai has become, without any doubts, one of the most visited and photographed cities in the world, reaching in 2017 the record number of nearly 16 million tourists who have spent at least one night in the city. 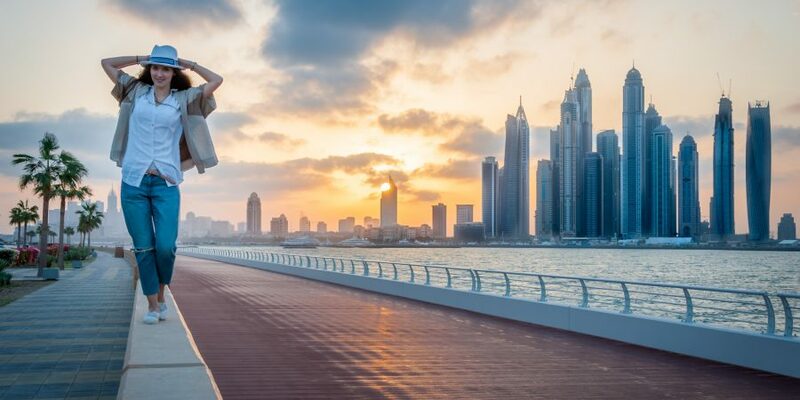 It’s no secret that Dubai has invested colossal amounts in the tourist infrastructure, adding yearly new attractions, so that tourists do not get bored for a second during their stay in the big city. Whether you choose to spend your time at the beach, at Legoland or at the Aquaventure Waterpark, whether you climb the world’s tallest skyscraper, venture into a desert safari, visit the souks full of souvenirs, spices and other wonders, whether you taste the culinary specialties from all over the world, you go skiing, or simply succumb to a mad shopping, all of it can be found and enjoyed in Dubai. With such an offer, I can easily assure you that you will not even feel when the week is gone. 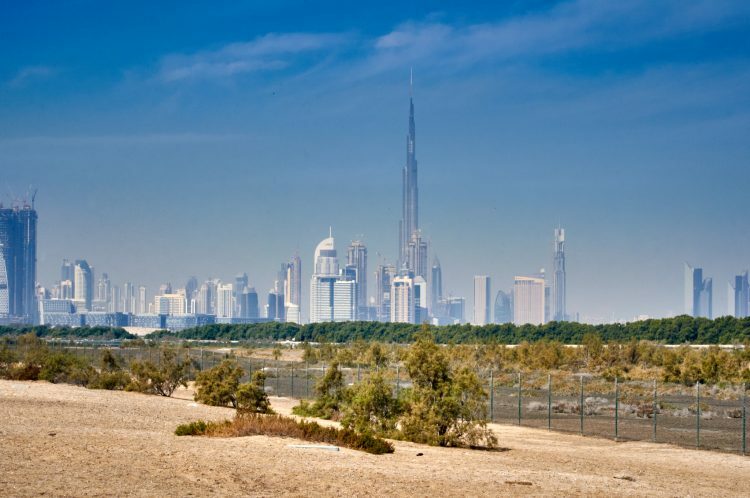 During the 5 years I spent in the UAE, I used to go to Dubai once every 2-3 months, and sometimes I would even stay for a night or two, in order to fully enjoy my tourist status. Almost without exception, every time I would find something new to do or to visit, and below I shortlisted Dubai’s most important attractions. Apart from a small description, I have also linked the information with the most useful sites, that will help you plan in advance and make sure you skip ques and extra fees. In the list below, there’s probably too much for a 1 week holiday, nevertheless, you can choose what suits you best. As I just mentioned the world’s highest skyscraper (for now, however, the newer tower expected to be higher than Burj Khalifa will also be in Dubai), I’d say let’s start right from Burj Khalifa! Inaugurated in 2010, the tower measures nearly 830 meters and has 163 floors. Two observation decks “At the Top”, and “At the Top Sky” were set up respectively at floor 124 and 148. 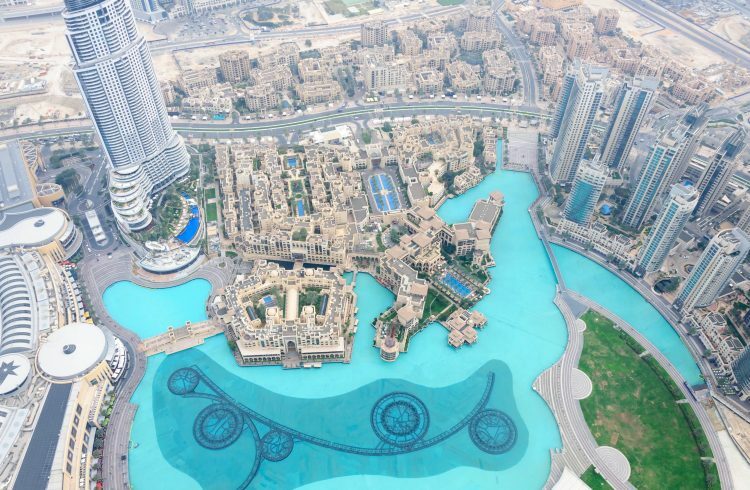 The view from the tallest building on earth will leave you speechless. On very clear days tourists can even see the coast of Iran. At the same time, one of the most exclusive hotels in the city, the Armani Hotel, whose design belongs to the Italian designer himself, is located inside the tower. 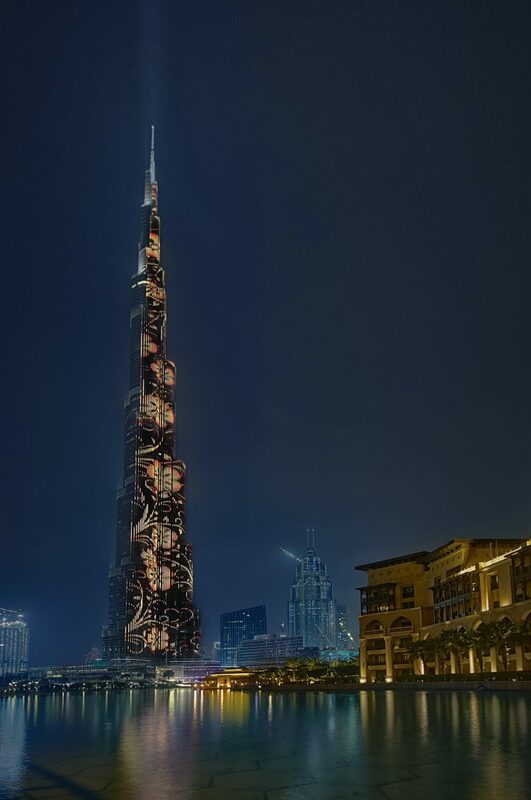 Its name, which translates to “Khalifa’s Tower”, is dedicated to Sheikh Khalifa bin Zayed al Nahyan, the leader of the emirate of Abu Dhabi. Currently, he’s also serving as the president of the United Arab Emirates. * The tickets for the access to one of the two observation desks can be purchased online here, or on the spot, subject to availability. Because the number of visitors is limited, sometimes access without reservation in advance may result impossible. In addition, at the counter, the ticket price is 75% more expensive than the online price. 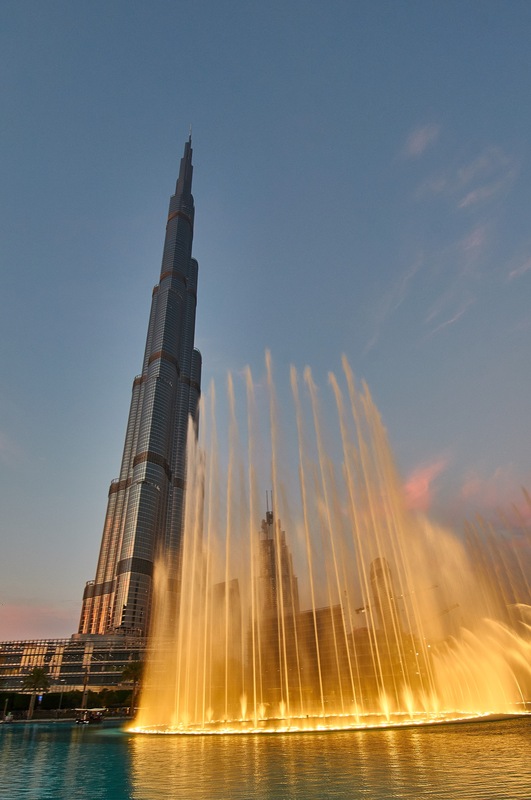 The first thing you will remark from a 555m height will be the Dubai Fountain, which occupies an area of 30 acres (approx. 122,000 sqm), being the world’s largest dancing fountain complex. The project was developed by the same company that created the fountain system at Bellagio Hotel in Las Vegas and the cost was of approx. 220 million USD. The show is perfect, with water jets reaching up to 152.4 m tall, waving on Arabic rhythms or famous classical arias. 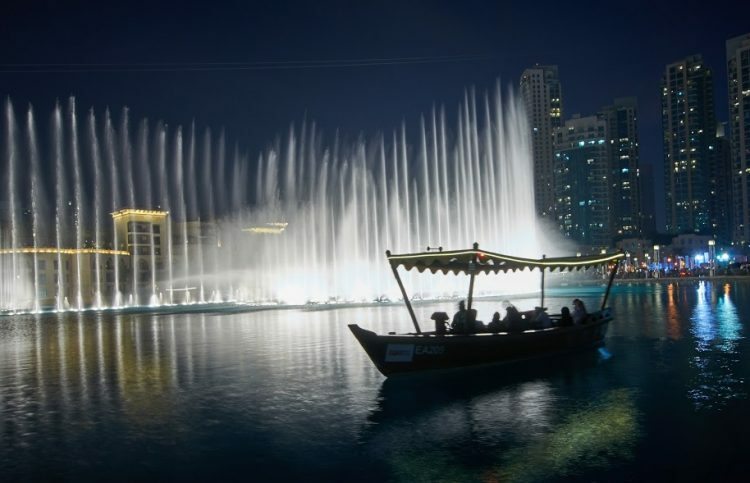 Visitors can enjoy Dubai Fountain dance every day, and the show program is here. After the fountains show or while waiting for it, you can enjoy a trip into the world of marine life at the Dubai Aquarium and Underwater Zoo. The Dubai Aquarium, located within the premises of the Mall of Dubai, is one of the largest in the world and hosts 33,000 marine animals, including an impressive shark colony. The braver ones can even choose to dive in a cage among the sharks. And if you do not have enough adrenaline, you can just take the glass boat mini cruise inside the aquarium. For more details and reservations, you can consult the official site here. In the immediate vicinity of the Dubai Mall you will notice one of the newest attractions added to Dubai: the Dubai Opera. Spanish tenor Placido Domingo inaugurated the Opera House on 31st of August, 2016. The construction itself is impressive and can accommodate about 2,000 spectators. If you want to attend one of the shows, here you will find all the information about future performances, prices, and reservations. Another landmark of Dubai that you should put on your list is the emblematic hotel Burj al Arab. It measures 321 m high and is built on an artificial island that rises at 280 m, being connected with the mainland through a bridge. 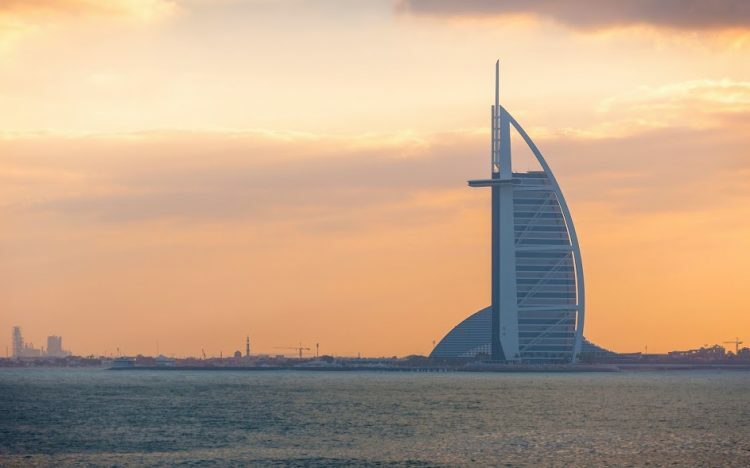 Often promoted as a 7* hotel, despite the fact that no hotel classification attributes more than 5 stars to hotels, Burj al Arab is certainly one of the most important targets in the city, even though it was inaugurated almost 20 years ago (1999). 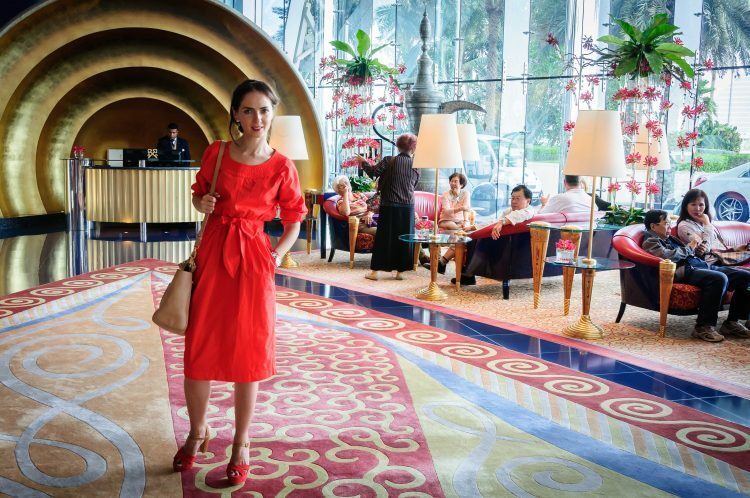 If you want to get a glimpse of the opulent interior you will have to make a reservation for one of the restaurants in the hotel. If you can’t afford to book your stay there, you can very well enjoy the afternoon tea at Burj al Arab. I’ll leave you all the necessary information here. 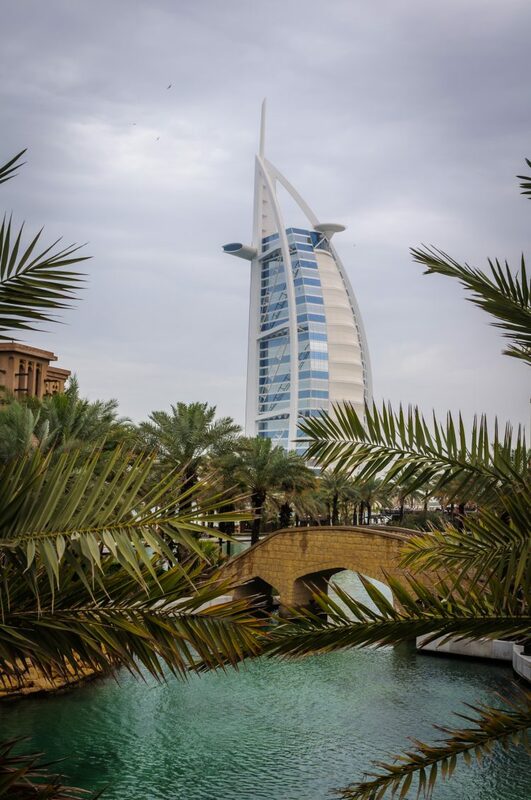 If you are happy just with an outdoor photo of Burj al Arab, then the best capture is from Souk Madinat Jumeirah, located in the immediate vicinity of the hotel. The Souk boasts a gorgeous Arabian architecture with an interior design specific for the region and is surrounded by canals that you can navigate on small wooden boats. You can also buy here Arabic souvenirs and delicacies or you can just relax at one of the cafes or restaurants overlooking Burj al Arab. Dubai Marina is seen as a second core of the city and is targeted both by tourists and residents alike . 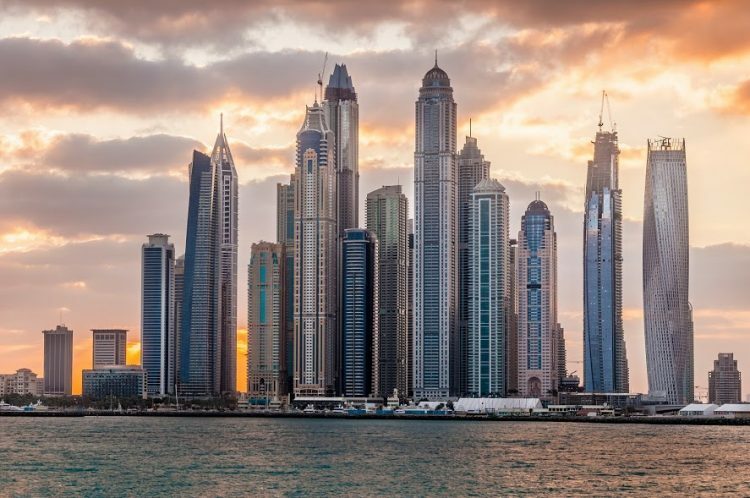 Considered to be one of the world’s largest fully-fledged marine, Dubai Marina is an extremely modern space built along an artificial canal that spans over more than 3 km. Dubai Marina is flanked by skyscrapers with very curious and edgy architecture, which you can admire along the 7 km long promenade. Here you can also find cafes and restaurants with mixed international profile. Nearby Dubai Marina is the Jumeirah Beach Residence (JBR), a residential area flanked by a public beach with golden sand and with free access for tourists. An elegant promenade runs along the beach, on which you will find a rich variety of restaurants, cafes, and terraces where you can serve all the meals of the day at reasonable prices. 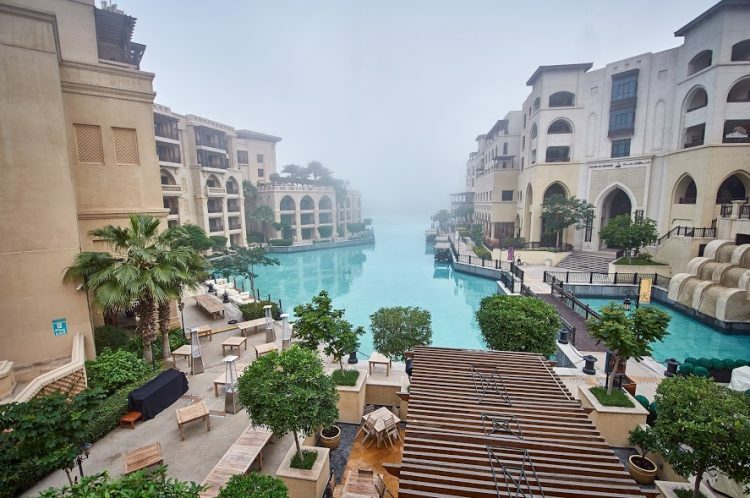 From JBR you can cross to Palm Jumeirah, the famous artificial archipelago, home to Kempinski The Palm Dubai, St. Regis Dubai – The Palm, One and Only The Palm, Rixos The Palm, and as well to the emblematic Hotel Atlantis. 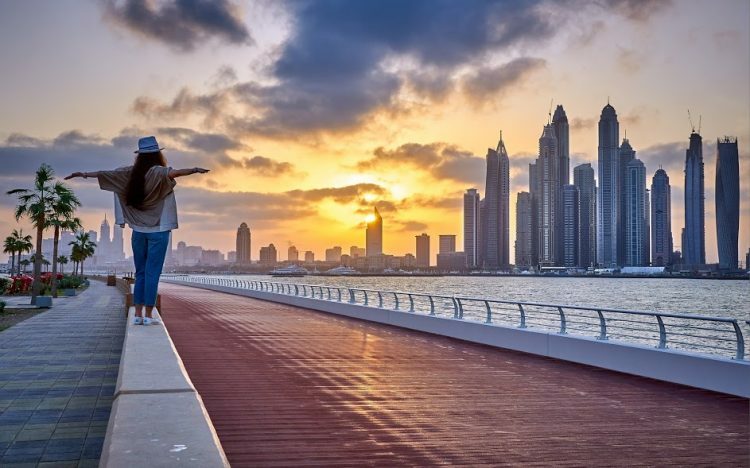 Starting October 2016, Palm Jumeirah inaugurated The Boardwalk, a promenade 11 km long, bordering the archipelago. 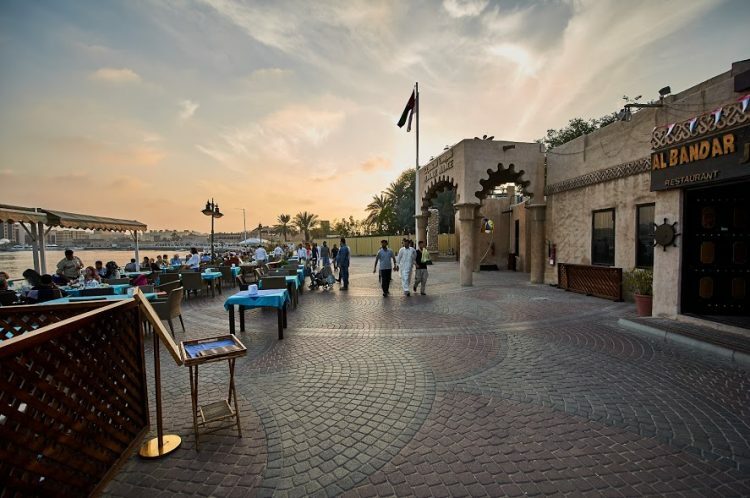 For those looking for history and traditional architecture, the Old Dubai is the place. 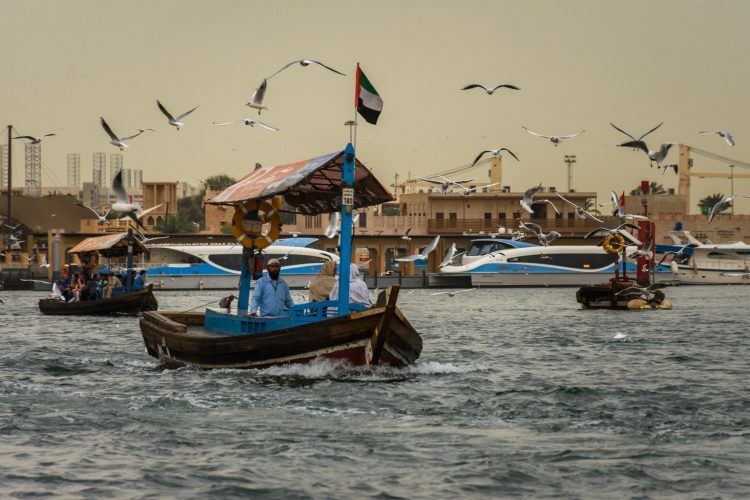 Often ignored by tourists, the Dubai Creek and the Bastakiya neighborhood are a genuine oasis of authenticity amidst a concrete, glass, and steel jungle. Here is where you can truly experience the beauty of the past. 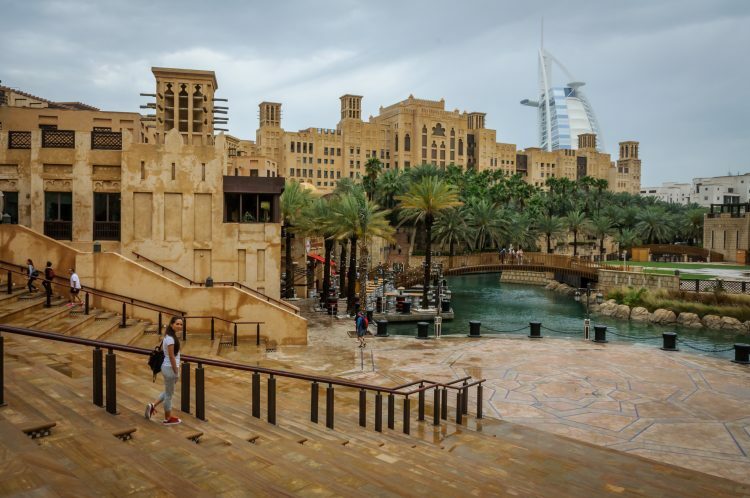 You will find the oldest buildings in town dating back to the late nineteenth century, as well as the Al Fahidi Fort, which houses the largest museum in the city. Visitors can cross Dubai Creek with one of the traditional wooden boats, known as “abra”, for a modest 2 Dirham fee (about 50 euro cents). At the same time, you can relax at one of the terraces and cafés located along the canal and you can admire thousands of seagulls who approach tourists in search of food. 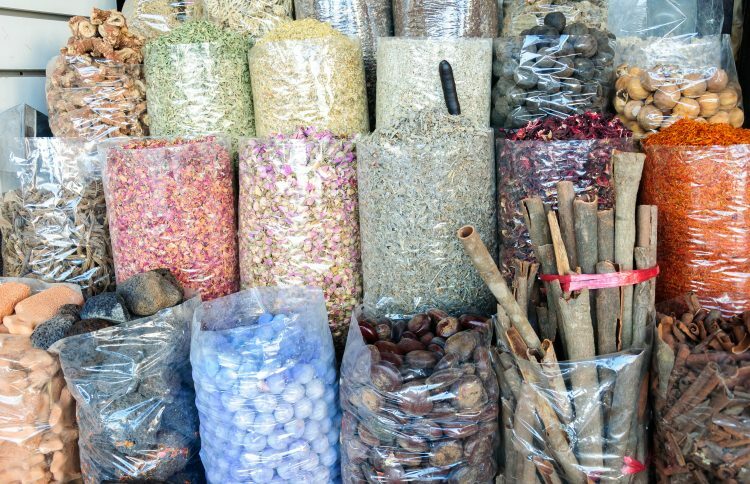 On both sides of the canal, you can visit the old Souks of Dubai (traditional Arab markets). The Gold Souk, The Spice Souk or The Textile Souk are places where you can easily lose a whole day negotiating with the merchants.And if the sunset surprises you at the Dubai Creek, the best option is to take an evening cruise along the canal and admire the city lights while enjoying a tasty dinner and a glass of wine aboard the boat. 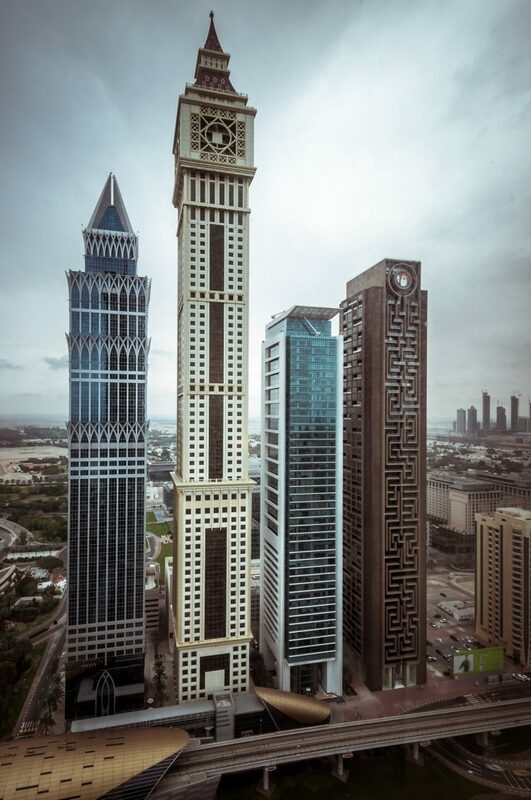 Back to modernism, you can not miss a visit to the Dubai International Financial Center (DIFC), an elegant space where important financial institutions are located. Apart from that, a great number of art galleries are to be found here, where you can admire the works of well-known contemporary artists from around the world. DIFC is located close to Dubai’s most transited boulevard: Sheikh Zayed Road, which is itself a top attraction in the city. 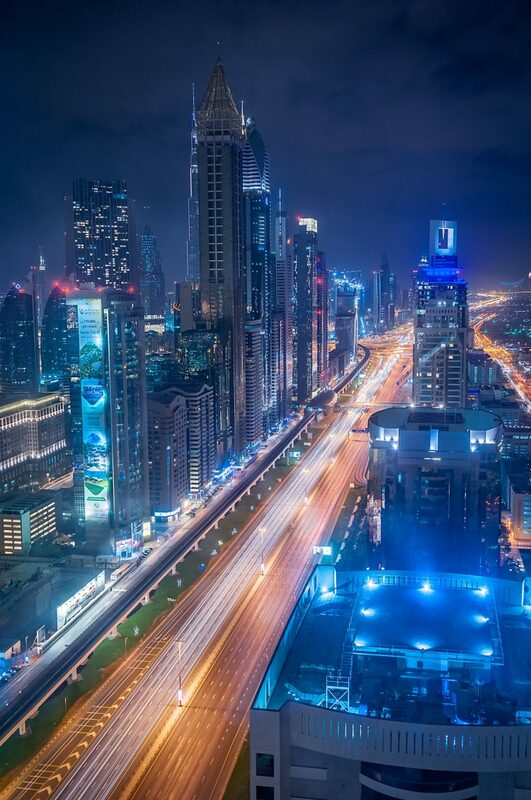 The giant skyscrapers align on both sides of this emblematic road, and in the evenings, when the lights of the metropolis turn on, it offers an unforgettable panorama. Ideally would be to witness the show from somewhere high. That is why the hoteliers did not miss out on this. 40 Kong from H Hotel is just one of the rooftop bars. Situated on the 40th floor, the bar offers spectacular views of the crowded traffic and millions of lights that clutter on the Sheikh Zayed Road until morning. If the DIFC galleries did not satisfy your appetite for art, in Al Quoz you can visit the city’s largest cultural district. This old industrial area has been converted into an art space, and along Al Serkal Avenue you will discover dozens of art galleries, non-profit studios, concept stores and workshops. For the art lovers, more information can be accessed here. If you are planning a holiday with your little ones, you could not have chosen better! From December 2016, Dubai boasts Dubai Parks and Resorts, a huge theme and entertainment park that includes Motiongate Dubai, Bollywood Parks, Legoland Dubai and Legoland Water Park. A week will probably not be enough to please the little ones, but you can take a look here to give you an idea of all the attractions and offers available. 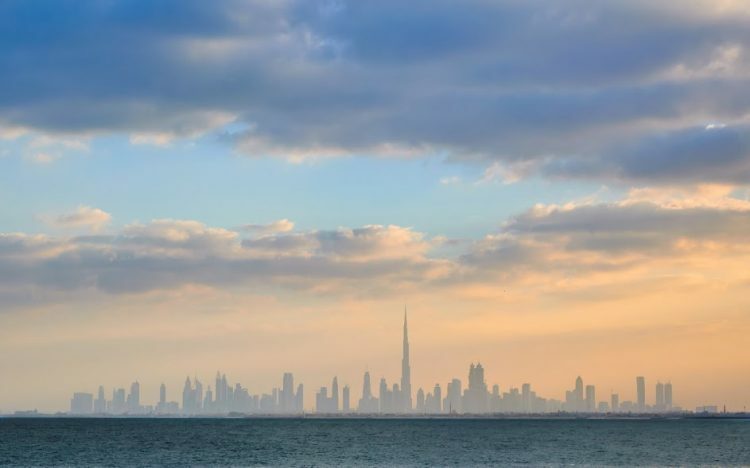 Excluding summer, when it’s just too hot, you can spend a lot of time outdoors in Dubai. I leave below my recommendations and I encourage you to check them with confidence, for a thorough understanding of what Dubai means. 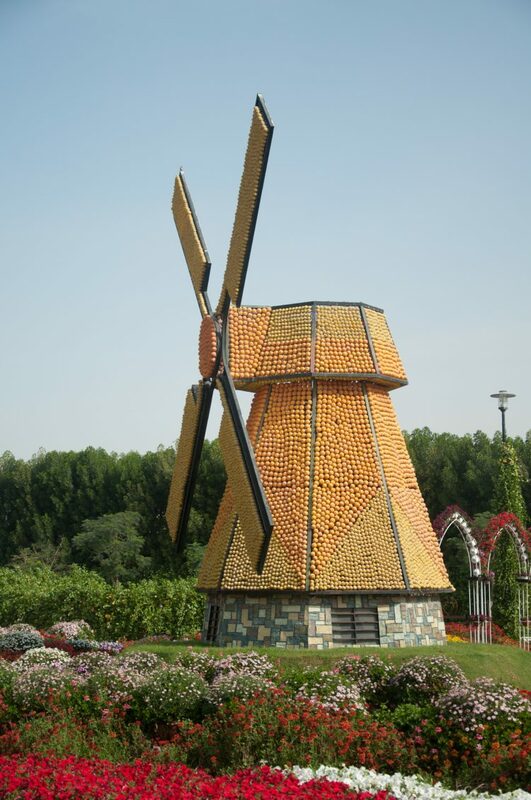 The Miracle Garden was inaugurated in 2013 and is the largest flower garden in the world. It occupies an area of 72,000 square meters and contains over 100 million flowers, styled in sophisticated arrangements. A walk in the Miracle Garden takes an average of 2 hours if you do not spend too much time in front of each arrangement. The same project includes Dubai Butterfly Garden, which boasts over 15,000 butterflies. More details about attractions and access tickets can be found here. It may seem unbelievable, but in the middle of a crowded city, suffocated by traffic and skyscrapers, there is a place visited annually by thousands of migratory birds. 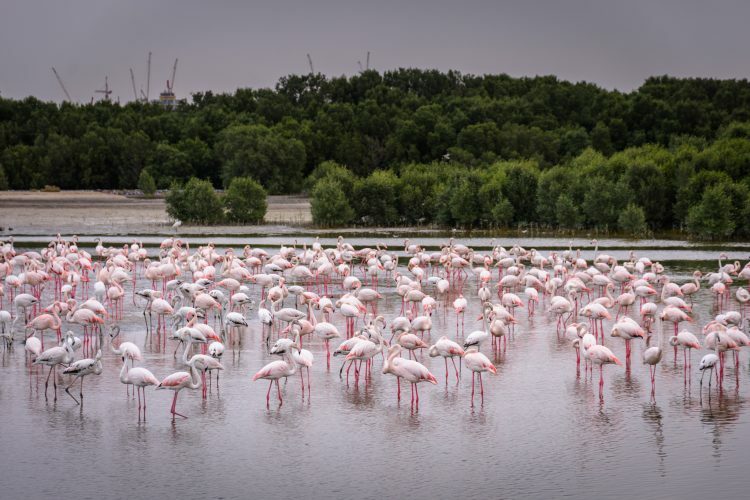 Ras al Khor is one of the few natural spaces in the protected urban perimeter around the world. 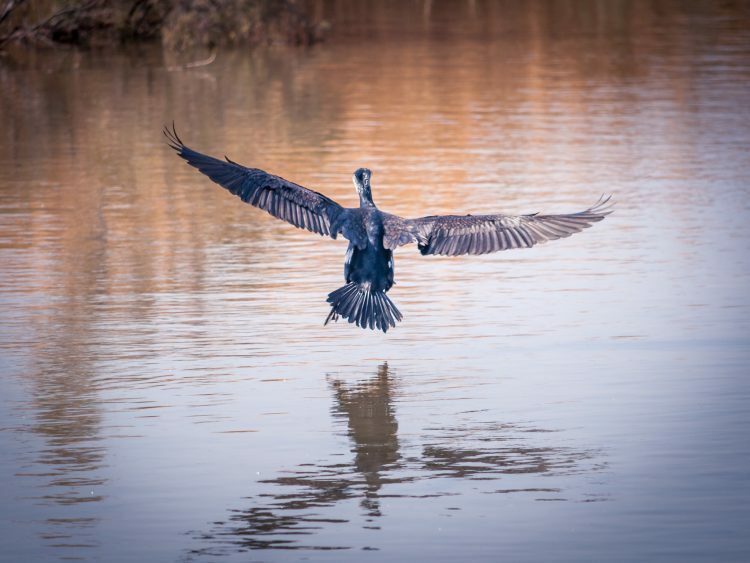 Birdwatching lovers can admire about 70 bird species, including superb flamingo bird colonies, cormorants, and egrets. Global Village is considered to be the largest entertainment and tourism project in the world and opened its doors in 2016. Initially, the fair had a relatively low participation (around 500,000 participants), but in recent years it exceeded 7 million visitors. Over 30 countries are annually presented at the fair, with pavilions exhibiting local handicrafts, culinary products, spices, clothing and many other curiosities. The fair is open annually during November – April, and more details can be found on the Global Village website. 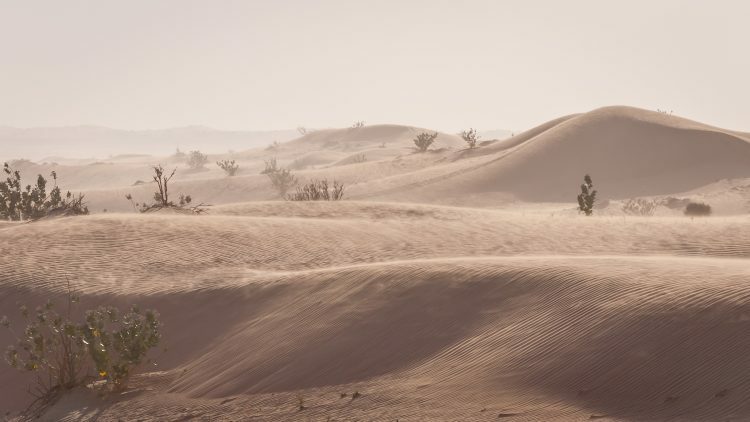 For the Dubai holiday to be a complete one, you can not leave the United Arab Emirates without a desert adventure. A safari among the dunes is both fun and educational. 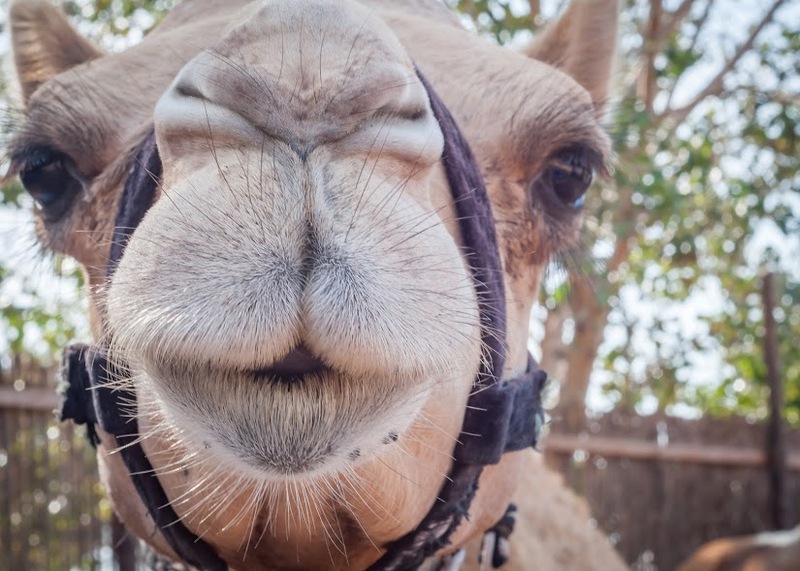 You will have the chance to understand more about the desert life, take a ride on a camel, paint your hands with henna, or venture out to a sandboarding session. And at the end of your vacation, the image of a desert sunset will be the most beautiful souvenir to bring back home. Explanatory note: Dubai can be visited throughout the whole year, but I personally recommend you avoiding the summer months (May to October) and the month of Ramadan, which changes yearly according to the moon calendar. This year (2018) Ramadan will begin on May 15th and will end on June 14th. For any other pieces of information, you can always consult the official site of Dubai Tourism. Previous Post Destination Madeira – made for walking! Next Post Spune-mi unde mergi in luna de miere, ca sa stiu cine esti!